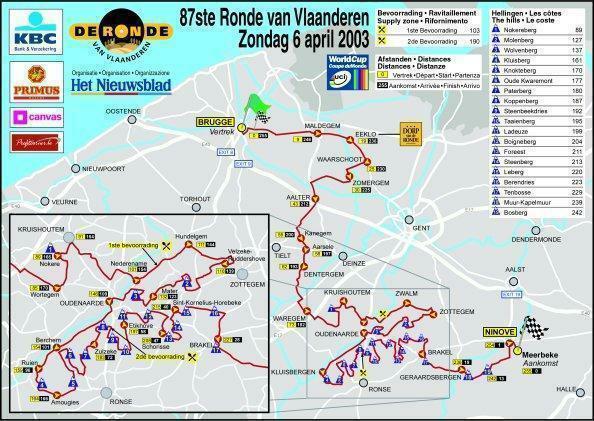 With De Ronde coming up on Sunday, here’s a look back at a classic edition of the race from 2003, my favourite (having watched every edition from 1996 onwards). The race was an interesting one, though not amazingly exciting. The fact that two of my (in retrospect) favourite riders contested the win makes it my favourite edition of the race. 1992 winner Jacky Durand was in the break of the day, which was eventually caught by a group of eight Italian riders (all from different teams) who had broken away over the Paterberg, which should turn out to be a pivotal hill in today’s race. After Paolo Bettini, Luca Paolini, Fabio Sacchi, Marco Serpellini, Gabriele Balducci, Enrico Cassani and Giovanni Lombardi were caught, along with the remnants of the earlier break, the great lump that was Dario Pieri attacked on the Boigneberg, with now-former HTC manager Rolf Aldag in pursuit. The cobbled section of Haaghoek saw QuickStep’s Lion of Flanders Johan Museeuw attack out of the peloton, with only Peter Van Petegem of Lotto-Domo, Cofidis’ Nico Mattan and Frédéric Guesdon of FDJeux (still on their books this season, though injured) able to follow. A select group formed as more riders joined the trio, including Museeuw’s teammate, the troubled Frank Vandenbroucke, Michael Boogerd of Rabobank, Australian champion Stuart O’Grady of Crédit Agricole, and US Postal’s Viatcheslav Ekimov. On Berendries, Mattan and Guesdon broke away, building up a small lead by the time the race reached Tenbosse. Ekimov, who had taken half a year off the season before and considered retiring, attacked in an attempt to bridge up to the two leaders as they rode up the tarmac climb of Tenbosse with 28km remaining. It was then that Museeuw attacked. It looked as though he was about to break the race apart, having already done so once. However, he was in a huge gear and quickly ran out of steam, with Van Petegem flying past him as he caught Ekimov. Indeed, this race was a sign that Museeuw’s career was almost at it’s end. He was 37 years old, and, unbeknownst to anyone then, of course, had already having won the final Belgian race of his career earlier that year at Het Volk. A stage at the Tour of Denmark would be his only victory in future as young Tom Boonen would soon take his place as QuickStep’s Flandrian leader. 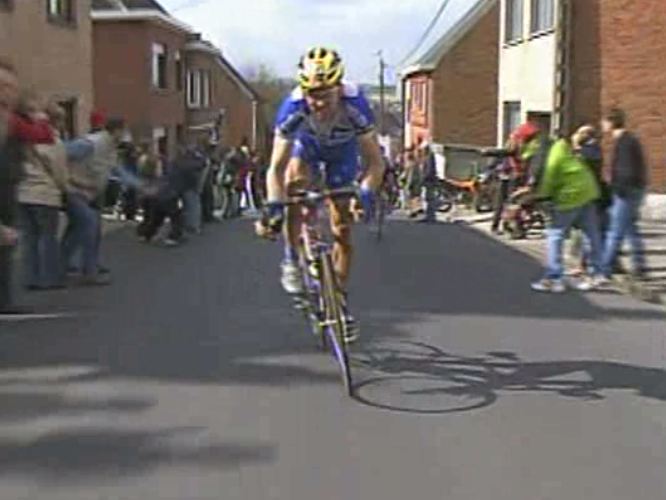 29-year old Vandenbroucke, along with Dave Bruylandts of Marlux would prove to be the only riders to catch Van Petegem. With the pair eventually joining up with him after he had caught Mattan and Guesdon. 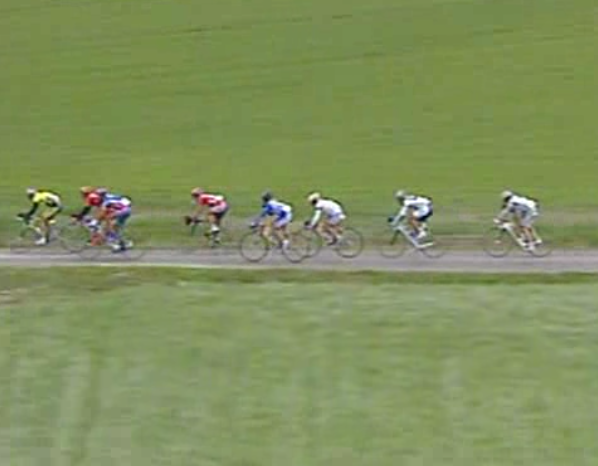 A group of six were chasing, with Museeuw nowhere to be seen. As the lead group rode over the famous bridge into the town of Geraardsbergen, with Guesdon attacking solo, the chasing six caught them, making it ten riders chasing Guesdon, with the peloton over a minute behind. As the group rode up the legendary Muur, Guesdon was caught by the group. 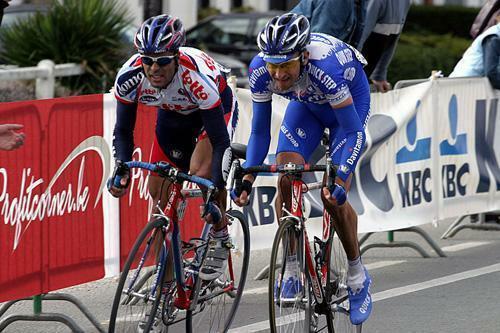 33-year old Van Petegem and Vandenbroucke then attacked, leaving the group behind. The two Belgians passed the chapel alone, to the obvious delight of the home fans. The duo gained ten seconds with their attack, and wouldn’t be caught by the chase group for the rest of the race. The pair shared the work, with Vandenbroucke trying his best to drop Van Petegem on the final climb of the Bosberg in the knowledge that Van Petegem was the better sprinter. The nine men behind were losing time, rather than gaining any – the gap grew out to over 30 seconds by the time the two were within five kilometres of the finish. As they rounded the final right-hand turn, Vandenbroucke had manouevred himself behind Van Petegem – the best position he could feasibly be in – but it wasn’t enough. Van Petegem sprinted to victory with some ease, repeating his victory over Frank of 1999. Stuart O’Grady rounded out the podium, confirming his classics potential. Van Petegem’s win cemented his place among the legends of Flemish cycling, and was the start of a phenomenal week for him – he took the win in Paris-Roubaix seven days later too. A bronze medal in the World Championships in Canada followed at the end of the year. 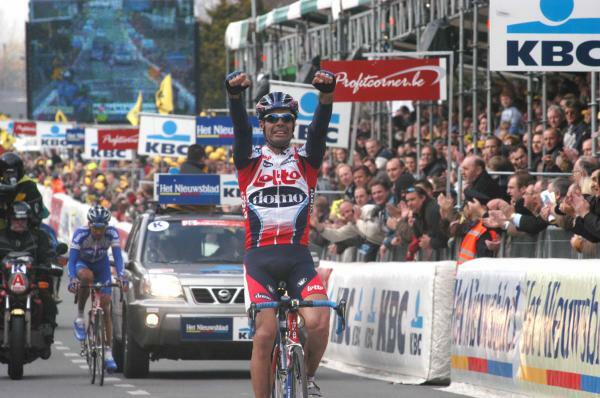 He went on to achieve some good finishes in various classics as his career wound down, with a podium finish at De Ronde in 2005 the highlight. Last year, he worked for Garmin-Cervelo, advising them during the Spring Classics. He and his wife also own a bed & breakfast named, appropriately enough, Le Pavé near his hometown of Brakel. The second place finish here would prove to be the closest Vandenbroucke would ever come to a win in a Monument again. Joining Italian team Fassa Bortolo the following year, and was fired after nine months and no victories. His best years were 1998 and 1999, winning Gent-Wevelgem, Omloop Het Volk, Paris-Nice, two stage and the points jersey at the Vuelta, and a dominant win in Liege-Bastogne-Liege in which he had predicted the exact place he would attack for the victory beforehand. In the early 2000s stories of his private drug use, drink driving, and association with doping doctor Bernard Sainz surfaced, with his career sliding to a virtual halt before he joined QuickStep. His career spiralled downwards after leaving Fassa Bortolo, finding himself at teams such as Mitsubishi-Jartazi and Cinelli-Down Under. In 2009 things seemed to be looking up for him, if not career-wise, then at least in his personal life – he was clean of drugs and led a more normal life. However in October that year the news came through that he had died of a pulmonary embolism whilst on holiday in Senegal with young cyclist Fabio Polazzi. His story is, sadly, one of a phenomenal talent, wasted. Still getting used to the Ronde without the finish into Middelkerke, and without the Kappelmuur, but I like how the new parcours brings the Koppenburg, Oude Kwaremont, and Patersburg right to the finish of the race. Sure, they shut down Cancellara at the base of the Muur a few years ago, but this new finish makes the closing 30 or 40K much more strategic.